On Wednesday, at GMT 12:30 p.m., the US Department of Labor will release the Producer Price Index (PPI) figure. It measures the changes in the price of products and services bought by manufacturers and service providers in the country. The higher cost of production is usually go on to the consumers. So, a rise in the producer price index indicates future inflation. Hence, this data is vital for binary option trading as it is used by binary options investors as a leading indicator of the overall US economy. Last month, the US month-over-month PPI increased by 0.5%. It indicated inflationary pressure on the economy. Analysts are expecting that this month it will increase at a lower rate, by 0.2%. The Bank of Canada will release the overnight rate on Wednesday afternoon, at GMT 2:00 p.m. The overnight rate is the interest rate that banks and other financial institutes in Canada use to lend and borrow funds among themselves. Binary options traders consider the overnight interest rate to be the paramount factor in the valuation of the Canadian Dollar against other major currencies. In fact, it is often stated that binary options traders analyze all other fundamental data just to predict the future interest rate decision. Hence, any major change in the overnight interest rate may create large price swings on Wednesday. Last month, the Bank of Canada kept its overnight rate at 1.25% and the forecast for this month is that the BOC will increase it to 1.50%. Since forming a bullish pin bar on January 31, 2018, the USD/CAD has climbed up by around 1130 pips. However, over the last two weeks, it started a bearish retracement. 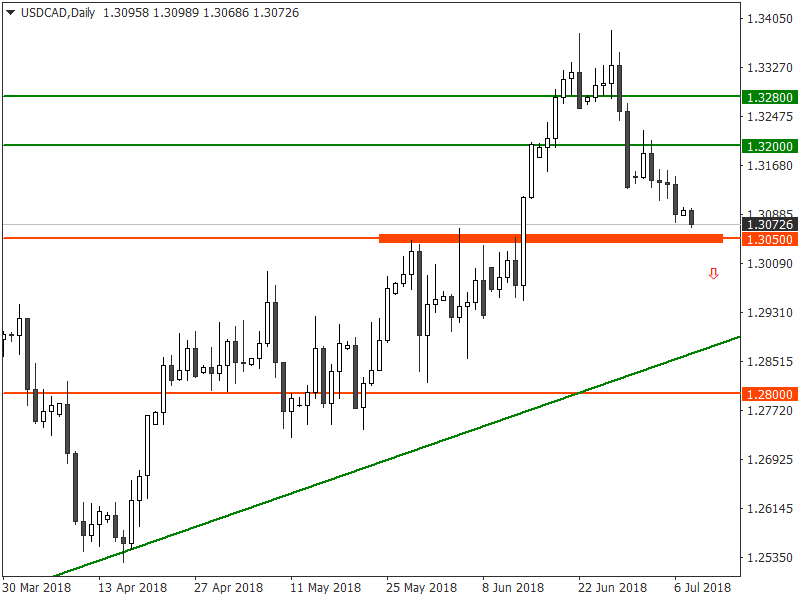 Currently, the USD/CAD is approaching the support near the 1.3050 level. The US Producer Price Index (PPI) will likely grow at a much slower rate last month compared to previous month. On the other hand, analysts are expecting the Bank of Canada to increase overnight interest rate to 1.50%. We believe it would set a bearish fundamental outlook for the USD/CAD this week. Therefore, if the USD/CAD closes below the support near 1.3050, it would likely attract additional bearish momentum in the market. Hence, US binary options traders should look out for trading opportunities below this major support level around 1.3050. Since breaking above the downtrend line on June 29, 2018, the BTC/USD has steadily climbed up to the resistance near the 6825 level. However, so far, it has failed to break above this major resistance. 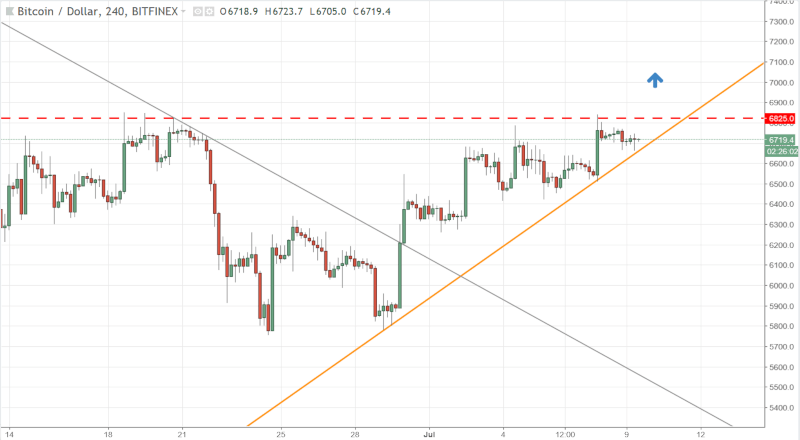 Moreover, the uptrend line is still intact, which indicates that there will be a large price movement – regardless which way the BTC/USD price breaks. Meanwhile, Chinese cryptocurrency exchange Huobi announced that its cryptocurrency exchange has successfully launched in Australia. As a result, the trading volume of major cryptocurrencies, including bitcoin, will likely surge in the coming weeks. Both of these two recent developments indicate a bullish thesis for the BTC/USD price in the short-term. Therefore, if the BTC/USD breaks above the major resistance around the 6825 level, it will likely attract additional bullish momentum in the market. Hence, US bitcoin traders should look out for trading opportunities above this major resistance level around 6825.